How did the Taj end up in Arabia? 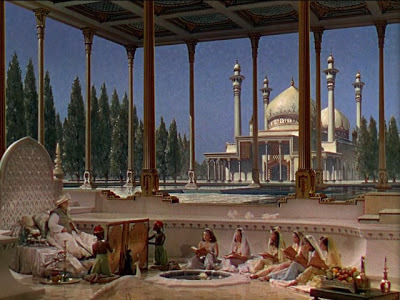 ARABIAN NIGHTS was a sizable hit in 1942 as audiences flocked to escapism from the depressing news out of the Pacific and Europe. 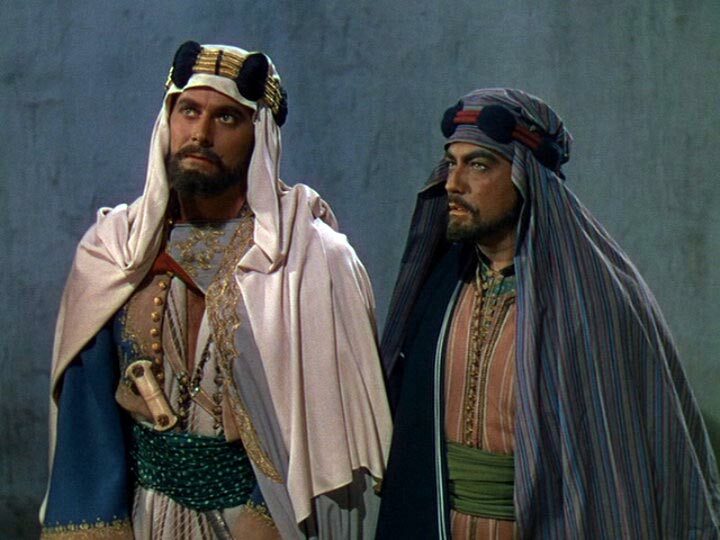 The Technicolor is breathtaking, especially the costuming dazzle. Mostly, it’s overdone to the point of sublime silliness, but occasionally the decor is arraigned in shots that hearken to the exotic Orientalist paintings that originally gave many Westerners their idea of all those places where curves were involved—curved slippers, curved swords, curved harem girls. Pity it’s not quite as much fun as you’d hope, as the storyline is too lame and kiddie-pitched to keep modern eyes open beyond the color palette. It’s a mix of characters from the famous stories: Scheherazade, Aladdin, and Sinbad are present but they’re all bland. Kidnapped beauty, good prince, bad caliph, gallops across the sand. Dialogue is ripe: lots of “by the beard of the Prophet”, “son of a dog”, “hear me,O knave” stuff. Some decent stunts. The elaborate look got Academy nominations for Cinematography, Art Direction, Sound and Score. There was no Costume Design category yet, or it would likely have copped that one. 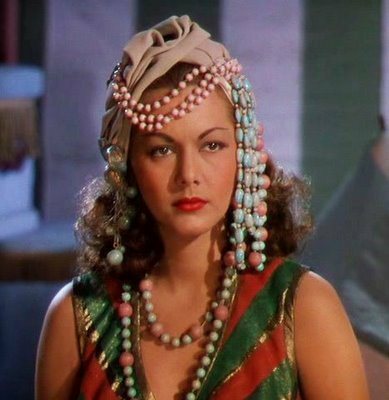 ‘Historically’,it’s the first team-up with nostalgic-camp stars Maria Montez, Jon Hall and Sabu. They’re backed by Billy Gilbert, Shemp Howard, Leif Erickson, John Qualen, Turhan Bey, Thomas Gomez and a tentload of pointy beards. Acquanetta makes her debut: pushed as “The Venezuelan Volcano”, she was actually an Arapaho from Wyoming. Erickson, who’d just divorced the ill-fated Frances Farmer, went into the Navy as a combat photographer and was twice shot down, wounded. The three leads all died young, Montez and Sabu at 39, both from heart attacks, Hall shooting himself at 64 to escape agony from cancer. Hall was an inventor, among his creations were hull designs for PT-boats. After two more goofy features like this, Sabu enlisted in the Army Air Corps and served in combat as a tail gunner. Just before he died in 1963, he had a physical where his doctor told him “If all my patients were as healthy as you I’d be out of business.” As for quotes, here’s one from Montez: “When I look at myself, I am so beautiful I scream with joy!” A little adulation goes a long way. Am I not more fetching than a bunch of figs?